French startup Lydia now lets you share your Lydia sub-accounts with other people. 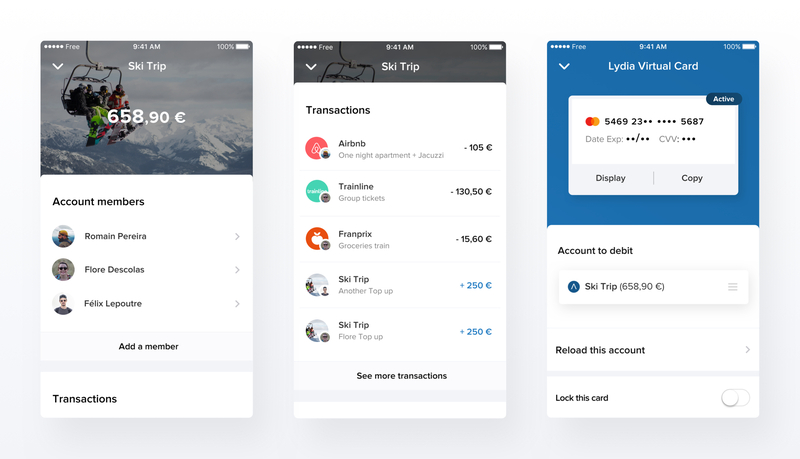 The company wants to make it easier to manage money when you’re traveling with friends, sharing an apartment with someone and more. When Lydia introduced its premium offering back in March 2018, the company completely rethought the way Lydia accounts worked. Users had a single Lydia account and were basically limited to sending, receiving and withdrawing money — it was all about peer-to-peer payments. Now, you can create as many Lydia accounts as you want, move money around, set money aside and top up each account separately. That was just the first step as you can now share those accounts with other people. This way, you don’t have to create a Splitwise group and track who owes what to whom. Instead of getting your money back after a while, people chip in and top up the shared account directly. Anybody can then safely spend that money. As always, Lydia is all about getting money in the app and out of the app as seamlessly as possible. When you create a shared account, each user can top up the account using other Lydia sub-accounts, a traditional bank account that you have already connected to the app or a debit card if it’s a small amount. If your bank account isn’t compatible with Lydia, you also get an IBAN number for this sub-account in particular. So you can initiate a traditional bank transfer from your bank account as well. Once the account is up and running, anybody can spend money. You can generate a virtual card, add it to Apple Pay, Google Pay or Samsung Pay, and associate it with the shared account. If you’re on a ski trip and buying raclette cheese for your group of friends, you can then pay with your phone and debit the shared account. If you’re a premium user and have a good old plastic Lydia card, you can also use it in any card reader and associate transactions with your shared account. Some websites already let you pay with your Lydia account directly as well. You can select your sub-account when confirming the transaction on your phone. You can imagine multiple different use cases for such a feature. This is a good way to share an account with your significant other without switching to the same bank. This could be a way to pay for utility bills with your roommates. “I use it with my son for instance. I created a shared account, I set up a virtual card and he added it to his Google Pay,” co-founder and CEO Cyril Chiche told me. He can then send him money that he can use instantly whenever he needs to. This feature will become more valuable over time, when you can pay with your Lydia account in more places. Mobile payment systems, such as Apple Pay and Google Pay, are slowly becoming more widespread. And Lydia has also been working with popular payment service providers to add support for more e-commerce websites. It’s a radical way of sharing expenses with friends and family members, but it could become the obvious way if Lydia becomes ubiquitous.